The Occupy Wall Street Movement is in general a very sad and telling snapshot on our society today, with their self centered, "give me", narcissistic attitude, and blame somebody else attitude, with no concept of economics or reality. I will qualify my statements/comments to note that I am sure there are genuine persons with genuine grievances in the OWS movement; however from what I have read, seen, and simple analysis of most grievances most of these persons are not grounded in reality. Just based on the ever increasing rude emails I receive in my business where others will attempt to blame me or others for their failure to read & understand, or get mad when I attempt to be as efficient with my very limited time to answer my many emails by "pasting" parts of my many researched articles in emails rather than provide a long 30 minute email or phone answer (at no charge). These persons simply refuse to read the plethora of aquarium/pond information I have provided. Similar to this, I recently had a person claim a working UVC Bulb was misrepresented because it would not work in his degraded ballast and he refused to read the extensive information I provided to help him with his problem; instead he chose to make rude, accusatory and blatantly false accusations. It is also noteworthy that when I/we are able to track persons that send us rude, demanding, etc., to blogs, Facebook, etc. we find that well over 80% hold almost exactly the same views as the Occupy movement (THIS IS A VERY TELLING FACT!). My wife works at a general merchandise store (similar to Walmart), and she too has observed this rapidly increasing narcissistic attitude of "I am owed something", with customers expecting much for free (basically she or others, including this so-called "Greedy Corporation" are placed on this planet to serve them with absolutely no compensation!). From my perspective (being in business 30 plus years), this problem has grown at an alarming rate in recent years and the often Socialist/Communist/Fascist aspect of the Occupy Wall Street movement exemplifies this as well for me. As well my terrible financial situation I find myself in is in part due to this "stick it to the man attitude" since a couple that took advantage of a personal leave of absence and liquidated much of my business and worse; the person who took advantage of my wife's postpartum depression and screwed us out of $1000s as well as permanently harmed my young daughter voiced this exact view (I was/am a small businessman who has ALWAYS placed his employees and honesty to customer above all else and honest persons through the years can attest to this). Frankly I can "see him" every time I listen to the Occupy protests, which is another reason I find the Occupy Movement so extremely offensive. This is a subject so many misunderstand on both the left and the right. This is a complex issue that I cannot cover in a blog post and do justice. I will however note that the Occupy Wall Street Crowd certainly has some merit to this claim, but it is very misdirected. For one much of this problem has been caused by liberals such as Barney Frank via regulations on the banking industry that forced many of the bad loans that later melted down. This is not to say many large corporations are not without fault and are to blame, but why do persons continue to do business with such corporations such as Bank of America, which by-the-way is a major contributor to liberal causes. But what really blows my mind is the company that is THE MOST corrupt is Google, yet how many of these Occupy Wall Street crowd are "googling" or using Google Search, Google Android Phones, etc? The facts are Google has been proven to plagiarize small business or writers for use with Adsense/Adwords then deny these revenue streams, as well it has been proven that Google Search is slanted toward large corporations, but new, innovative, or researched companies or information articles. *Also why is there no anger at the Obama administration which has supported bail-outs of corporations (in other words "Crony Capitalism")? As a small business, no government entity has ever come to my aid (nor should they). What about denial of Food Stamps when we were struggling a few years ago? The Food Stamps program is very corrupt and is based on accounting methods with no basis in the reality of business. Where is the anger here? Of coarse there is none since many in this crowd are receiving these benefits while others struggle all night collecting cardboard and bottles to feed their families. The recently released study of “heavy hitters” by the Center for Responsible Politics showed the amount of money the top 140 political donors gave to Democrats and Republicans from 1989 through 2010. Four of the top six gave $170 million over that period, with $151 million going to Democrats, and less than $3 million going to Republicans (the difference going to unaffiliated or independent political groups). In simple math, Democrats received 89 percent while Republicans got less than two percent. *Back to corporations (& while this does not justify greed), it is important to note that Entrepreneurs/business are the ones that create jobs and "putting it to the man" is not going to get you a job! The bottom line is while corporate greed and more importantly "Crony Capitalism" is a legitimate complaint (probably the most legitimate "Occupy" complaint IMO), there is no understanding of who creates the jobs, the fact that not all business are "greedy" (just as not all of the Occupy Wall Street Crowd are scum or without legitimate grievances). There is also an extreme misunderstanding of economics, and lack of reality of how much more regulations will simply add to big government which is the real problem. What this crowd simply needs to do is stop being hypocrites and simply boycott the companies that they feel this way about and stop using companies such as Bank of America and Google that are known for these issues! As well tell government from City to Federal to end many of the regulations (that large corporations can get around, buy their way out of, etc. anyway), but HURT small business entrepreneurs which are the TRUE area of growth and jobs in this country. *Put an end to agencies such as the EPA that cause more problems than they solve. 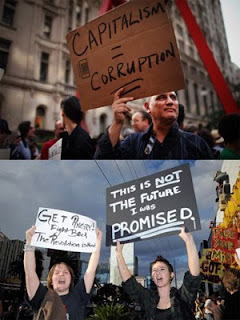 WHAT WE NEED IS LESS GOVERNMENT, NOT MORE as many in the Occupy movement demand!! Finally; corporations are simply entities that serve their stock holders, of which these stock holders include many retirement accounts and similar held by everyday persons (including many of these "Occupiers"). Many corporate CEOs & Board of Directors are attempting to meet voting shareholders demands for growth, dividends, or both and admittedly many attempt to meet these demands through less than moral business practices. While the above is admittedly an over simplification, it still is a starting point rather than blaming others, I know their are companies such as Bank of America or Google that I would never buy stocks or Mutual Funds that contained their stocks or bonds there in. The Top 1% control too much of the income/assets!! Again a legitimate complaint at the surface, but where is the complaining about the Hollywood elite, pop singers, athletes, etc. that make more money in a day than I or others will make in a life time? Let me state that these persons only make this kind of money because persons are willing to pay. As an example, I do NOT watch Professional Football, only college; so I can legitimately complain about what pro players make. That said, this is MY choice and someone who prefers pro football has every right to watch and enjoy the game, just do not complain about how much these persons make unless you are willing to stop financing this by your support. In another example; I have a good friend who recently lost his wife of many years and mother of his children due to brain cancer. He has severe diabetics and other severe health issues and struggles with depression too. A lady where he lives came along side him. She has taken care of him both in simply being there for him, and taking care of his needs. She also happens to make over $400,000, which places her in the 1% (approximately $375 is the cutoff). She is like an angel from heaven, but in listening to many in the Occupy Movement, anyone who is in the 1% is the enemy (or simply evil) From my understanding of the simple human compassion or the Bible, to call "Good" evil is simply evil itself as evil can exist along side good (darkness along side light), thus making these "Occupy" persons accusing this good person of being the enemy simply evil themselves!! Then there are the attacks by Obama, the News Media, and the Occupy movement on Mitt Romney. This quote says it all: "Apparently, I'm supposed to be more angry about what Mitt Romney does with his money than what Barack Obama does with mine." Some of these clowns need to look at how much Romney has done charitably with both his time and money; VASTLY more than Obama or his sleazy ilk. An important side note is government regulation is strangling small businesses and the jobs it creates. We might make a dent in spreading the wealth around by shutting down the Environmental Protection Agency and similar government agencies. The FACTS ARE only large corporations (the top 1%) can afford to pay the environmental studies which are nothing more than bribes in many instances. I have a friend in construction who has told me so many of the ridiculous regulations such as having to make a washout basin for concrete. This same concrete is poured on bare soiling when building roads, sidewalks, etc. This is a ridiculous waste of efficiency and money that protects nothing. The newest outrage is the attempt to shut down ports; Who does this hurt? It hurt the workers at the ports, it hurts retailers such as myself that supply many of these products, it hurts those I employ, it hurts consumers that depend upon many of these goods and will now pay higher prices. Bluntly if this evil action that hurts so many families and jobs by the scum in the OWS movement does not convince those on the fence, nothing will. This is another demand often heard which is utterly ridiculous. I, nor does anyone else owe anyone for their higher education. Have these persons heard of getting work and saving first, or as I did working a 40 hour job, and even selling Crystal on the side while attending Cal Poly University? I have friend that owes $90,000, yet he can NEVER pay this down because of a government bull #### screw up that will never allow him to use what he is educated to do (he even saw a judge that agreed and ex-sponged the system, but this still would not clear the way). The credentialing board *deliberately* did what they did, knowing it would in large part ruin his future. As well what about universities that push students unsure of what they want to do in life into studies such as "English', whereby when they graduate they cannot find a job other than flipping hamburgers with little hope of paying off their school loans? Once again where is the outrage by the OWS crowd here?? Maybe some honesty to potential students to look to a trade school if they are not sure of what they want and if the result is less students in some University departments, so be it. Again the problem is we need less government, more hard work, and more honesty. *Alec Baldwin; what a hypocrite considering his Capital One commercials and the FACT he is among the 1% in income/assets. Alec Baldwin is a great case study for OWS supporters to learn from; here is a guy that epitomizes the condescending attitudes of many liberals (his recent incidence on an American Airlines flight is a clear example). Alec Baldwin makes more money than most persons dream of in a lifetime and I do know an honest OWS supporter who complained about him and actors/actresses in general as to the amount of money they make. However my answer to anyone who does not agree with an actors, musician, etc. as to their income is the same as with a corporation; simply do not watch their movies, buy their music, etc. I will also add that while I do not have any respect for Alec Baldwin, and it would be nice if my talents could generate the same income as his;, the FACTS are his dry humor and acting abilities are such that many persons are willing to pay him for his talents and for me or any other person to be jealous or covet his talents or income is simply silly and wrong. The short answer is most of us do not have talents that will pay the big bucks and to expect equal pay for unequal talents is ludicrous. I simply refuse to watch or support with my money anything this man does, but others choose to do so, which is their right as well. See: Millionaire Michael Moore: I'm Not Part Of The 1-Percent! For those who think this is just a fringe support, you need to read YouTube comments on videos about the anti Jewish sediment within the "Occupy" movement which is running 90% anti-semitic and supportive of Nazi views! "Wall Street made Bush rich and we should shut it down." "We don't know where it comes from. It just appears, and we eat it." "This is not the future I was promised"
"I think the Zionist Jews should be run out of this country"
"These Jews don't? understand the concept of hard work. Perhaps that is what killed them in the German WORK camps rather than these fairy tales about gas chambers?" "The Jews are now crying that Americans, like Arabs, are waking up to the Judeo-Zionist Control Grid." "Those damn Zionists again, first they create that whole Holocaust ? "myth", then manufacture evidence from all that documentation and actual evidence that Germans just happened to leave lying around, forge thousands of eyewitness and survivor confessions, and to top it all off, get those dumb Germans to take the blame for the whole thing." The YouTube Comments on this last video in particular tell a lot, as the vast majority are hateful and if this is a representative of the Occupy Wall Street Movement, this is a good reason to not support it and to condemn those such as Nancy Pelosi who do. 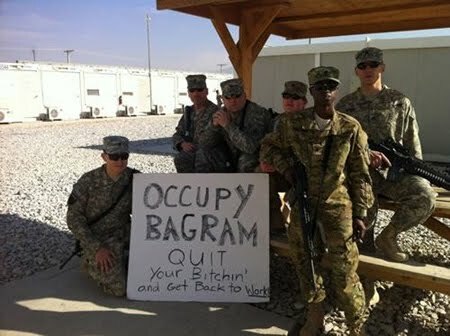 What do you think of the Occupy Movement? The 1948 Film (now a Video) below, while taken in context of the time period still is both educational as to how it shows the dangers of the thinking of the Occupy movement, Barrack Obama, and Big Business as well (these businesses are NOT too big to fail).